Is it possible to have a wild, exciting space adventure without resorting to magic? 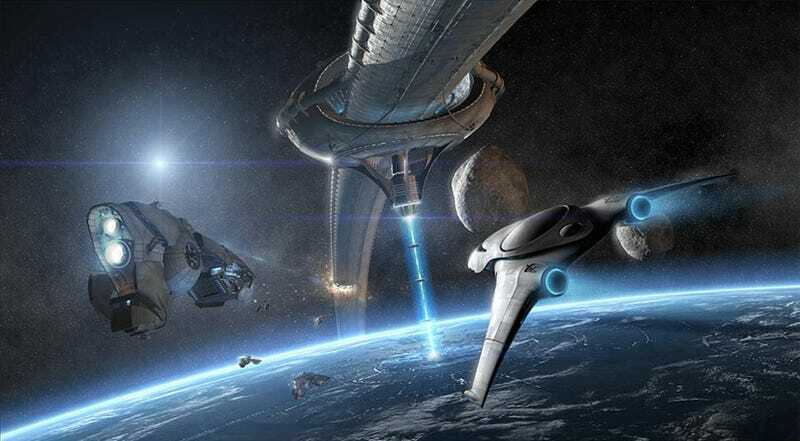 Or is there just no way to imagine conquering the vastness of the cosmos without warp drives, hyperspace, miraculous shielding and other fancy devices? Some of our best and brightest minds are writing "mundane space opera," in which everything is scientifically plausible. And now, you can too! We'll teach you how. When we were at Worldcon in Chicago, we had several conversations about mundane space opera. And we went to a panel about slower-than-light travel and interstellar trade, where Charles Stross shared some tantalizing tidbits about his new mundane space opera novel. Also working on a mundane space opera? Geoff Ryman, who invented the term "mundane science fiction", to describe SF where everything is scientifically plausible. Space is really really big. Space is mind-numbingly vast and the energy requirements for travel are even more so — double your velocity, square the kinetic energy requirement (and that's in a merely Newtonian approximation — relativistic energy requirements are even worse). There are just so many myths about space travel in classic science fiction. And this creates some huge challenges, especially if you're aiming to write a swashbuckling adventure story in space. People want a space opera to be "suitably epic and grandiose," says Blue Remembered Earth author Alistair Reynolds, who's sometimes classified as a space opera author but doesn't really consider his own stuff space opera. "It's not enough that the fates of mere individuals or even mere worlds are at stake," says Alistair Reynolds. "Effective space opera operates on a much bigger stage than that – it's galactic empires, or go home." Space opera aims for the opposite effect from hard science fiction, says Reynolds — hard SF wants you to feel a "chilly appreciation" of the overwhelming vastness of space and the "essential smallness of the human condition" against that backdrop. Space opera, meanwhile, wants you to feel a "limitless potential for adventure and mystery and exoticism in a galaxy of a billion worlds." Or as Daniel Abraham, who's one half of Leviathan Wakes author James S.A. Corey, puts it, "What makes space opera operatic isn't the size and power of the engines or the setting, it's how big the emotions are. Gun opera is Chow Yun Fat with a pistol in one hand and a baby cradled in the other. Space opera is millions of voices crying out in terror at once, and being silenced." Space opera is vast empires and millions of worlds, and it's hard to do that when you crawl along at sub-light speeds. "There's no doubt in my mind that you can tell a very gripping and involving story by hewing close to 'real' physics, with all its constraints," says Reynolds. "For every plot door that reality shuts, it helpfully opens another." One key to making slower-than-light travel feel thrilling is to think of the Master and Commander novels by Patrick O'Brian, says Stross. "If Patrick O'Brian could make his Earth feel vast, then the same sort of scale effect should be applicable in SF." Travel times within a solar system at very fast sublight speeds, even with nuclear propulsion systems, should be similar to traveling around the Earth during the age of sail. "Vast distances, isolated outposts, that sort of thing," says Stross. Some authors have found ingenious ways to make a space adventure feel "both complex and roomy," says Reynolds. For example, "Vernor Vinge's masterful invention of the "Zones of Thought", as explored in A Fire Upon the Deep," manages to make space feel both vast and also full of possibilities. Sean Williams, author of the Atropolis series and co-author of the Evergence trilogy with Shane Dix, says that he really struggled with how to cope with "the fact that interstellar travel is going to take a loooooong time" without going faster than light. At that point, it's easy to throw up your hands and say, "Well, physics has beaten us. We're never really going anywhere." Or else, resort to wormholes, cryosleep or generation ships, all of which "feel very familiar now." So Williams decided he wanted people who lived a long time, without using cryosleep. "For Astropolis, I wanted characters who were dynamic, living in the moment, vigorous — not bored ice cubes waiting out the aeons." Instead, he came with the notion of people being able to "set your internal 'clock,' or tempo, so one second of your time could be the equivalent of a voyage to Alpha Centauri (or the other side of the galaxy)." Or you could make "squeeze an entire lifetime into one second." So in Williams' universe, characters could travel across the galaxy in what seemed like a short time period, but they're still very aware that "each journey costs hundreds, maybe thousands of years." And yes, it's hard to go home, or to govern a whole galaxy — but science fiction is about exploring things that seem impossible, says Williams. How to Rule the Galaxy! So let's talk about that next — as Reynolds and Abraham say, space opera isn't just about a few worlds, it's about millions of worlds and boundless possibilities. How can you possibly imagine an interstellar civilization where it takes centuries to travel from one place to the next? It's very hard to imagine how any kind of political system could be extended and enforced across a volume of space more than a few light years wide. A few solar systems, maybe. You only have to look at the administrative difficulties in the present European Union, and imagine how much worse they'd be if the news from the edge of the Union was decades out of date. Or maybe things would be better, who knows? But while I can well imagine that a "galactic empire" of the old science fictional kind might be totally impossible, I don't see any problem with the idea of individual solar systems embracing similar sets of values, especially if they've been demonstrated to work well elsewhere. You might get a loose commonwealth, where the individual systems are more or less independent and self-sufficient, but which are running similar democratic and financial models, just because they've proven reliable over time – a kind of galactic empire by local franchise. It's very difficult to see how there would ever be anything other than very occasional contact between these systems. But the exchange of information could be continuous, leading to a feeling of being plugged into a wider community of worlds. At the Worldcon panel on slower-than-light travel, people were pretty pessimistic about even sending information across vast distances — because signals would degrade across the light years, and it would be hard to send complex information between star systems. Reynolds feels these objections are overblown: "If we ever did need a reliable interstellar communications system, we would develop one – even if it required the resources of the entire solar system, and a transmitter/receiver technology as big as the asteroid belt." Still, Stross believes that any kind of interstellar economy would have to work much differently than anything we've yet created. Given the huge energy costs and long timescales involved in transporting physical objects across interstellar space, you wouldn't want to trade actual goods back and forth. On the Worldcon panel, he and other panelists agreed that the only interstellar trade would be in information — perhaps, said Stross, in "uploaded human minds." And Stross told the Worldcon panel that he's invented a new monetary system, called "slow cash," that could work in a civilization where it takes decades for a spaceship to travel from one place to another. His new novel, coming in 2013, is an elaboration on this notion. Do interstellar travelers have to be posthuman? One thing that Stross and the other panelists at Worldcon seemed pretty sure of: Our descendants who conquer other star systems won't look exactly like us. Stross even quoted an opening passage from his new novel, where someone is asked to jettison his legs as a downpayment for a space voyage. "To be brutally frank, I simply can't swallow 'serious' space novels that contain only humans as we know them today," says Williams. "It simply strikes me as too unlikely — that someone at some point in our future won't look from the harsh environments of the universe to the fragile human form and think: 'We can do better than that.'" And if your universe doesn't include other intelligent alien races, then it seems likely that "humans will evolve to fill every available niche," says Williams. In fact, he says this is one of the few reasons he could see for an interstellar war — in his novel Geodesica, he depicts a war between "normal" humans and their "evolved" cousins over the notion that "humanity is different according to different kinds of people." But Reynolds says it's not a "foregone conclusion" that people have to be posthuman to travel in deep space — although if you go far enough into the future, maybe everyone will be posthuman by then anyway. " If we ever do have the means to cross interstellar space, then we'll probably also have the means to make the ride as comfortable as we choose, meaning that you wouldn't have to become something other than human unless you really wanted to," says Reynolds. One reason why many futurists and authors believe that only posthumans will travel between stars is the cosmic radiation — which could be a lot harsher outside of a solar system. But Reynolds is optimistic: "If we ever do have the energy to send people and payloads out into interstellar space at significant fractions of the speed of light, I'd imagine we'll also be able to spare a bit of energy and/or mass to build in passive or active shielding measures against cosmic radiation." Talking about dire warnings about cosmic radiation and the impossibility of even sending messages between star systems, Reynolds says: "These arguments all remind me of those solemn Victorian treatises of how transatlantic powered flight will never be workable, due to the intractable difficulty of carrying sufficient quantities of Welsh steam coal for the boilers." Get rid of the term "starship"
Stross recently attended the 100-Year Starship conference, and the main insight he came away with was that we need to get rid of the term "starship." Instead, we should divide that concept into two separate ideas: "probe" and "home." We're talking about either a one-way exploration mission that is junked after it collects and returns data, or something that has to be able to maintain and build out an entire human civilization at the far end of the journey. Right now, maintaining a space program appears to require the resources of a superpower with a population on the order of 100-300 million people — at a minimum! Not only do you need engineers, you need all the specialities that keep the engineers fed and sane (from shoemakers to musicians) and the educators to educate the next generation of engineers (and everyone else) and retain the institutional knowledge that will otherwise slowly trickle away. My best guess is that it's a combinatorial problem, and by the time you have the minimum set of people and skills required to run a generation ship you've got something the size of Norway In Space: millions of people, tens of thousands of specialities, the infrastructure to educate new generations and repair or replicate essential equipment. Reynolds agrees that if it takes centuries to get from world world, "it's not hard to see that the travellers would come to see their ships as their true homes." Personally, while I don't mind military elements in my SF, I'd like to see many fewer stories involving organisations with command hierarchies and tactical rulebooks lifted almost without change from today's navies and armies (or worse, from the navies and armies of Napoleon's time). I also haven't got a lot of time for those space operatic universes where all the human and alien factions have conveniently similar levels of technology, barring a few differences here and there. If we ever do encounter an alien intelligence, it's likely that there will be an almost incomprehensibly huge technology gap, a bit like the technology gap between people and hamsters. All those Star Trek stories of cat and mouse between the Federation and its Romulan or Klingon adversaries, while enjoyable, are I'm afraid highly unlikely. How does a Star Wars writer create realistic space opera? Williams is in a fairly unusual position — he's written realistic space adventures, without faster-than-light travel or humanlike alien life forms, and he's also written a number of Star Wars novels. I'm not sure if I can completely justify this, but in my mind Star Wars isn't space opera. That is, I don't approach writing Star Wars novels the same way I approach writing space operas. Yes, lots of aliens. Yes, space ships and lasers and hyperspace and whatnot. But for all that it's set against the backdrop of an entire galaxy, Star Wars is limited thematically and creatively in ways that modern space opera isn't. It resists scientific speculation; it's not overtly interested in the human condition; interpersonal dynamics take particular shapes and paths that reflect the original works (i.e. the classic trilogy and its emphasis on adventure and romance); there is, weirdly, very little sense of scale (beyond how big certain ships and space stations are). It's its own thing. I'm not saying that it's not a fine thing. I'm not saying it's missing out. Just that it's different. When I'm playing in that universe, I'm having just as much fun, but the toys are very different. The Evergence trilogy, btw, started off as Shane Dix and me trying to tell the Blakes 7 story in the Star Wars universe. It quickly expanded into something much bigger than either—and I think that's what I mean when I say that they're Wookiees and womp-rats, really. Different offshoots of the same tree, definitely, but the fruit is falling on very different ground now. James S.A. Corey's series that begins with Leviathan Wakes is often described as "mundane science fiction," but co-author Abraham doesn't really like the term — or the notion of trying to exclude anything too fanciful. "If you look at the kinds of things Ryman was calling stupid, it's all about making science fiction more serious and rigorous," says Abraham. "It's about limiting the literature to being sort of the fiction arm of Popular Mechanics. It's an interesting enough project inside science fiction, but God help us if we start taking it as the definition of good." It seems to me that the common wisdom that "science fiction doesn't sell" grew out of a failure that started in the 80s, when science fiction writers started trying to be Very Serious People who were doing Very Important Work, and we started getting manifestos aimed at narrowing the field and appealing to a narrower and narrower — and more to the point, purer and purer — audience. Mundane science fiction turns its back on the "stupidities" that underlie books like Dune, The Left Hand of Darkness, The Dispossessed, The Forever War, Ender's Game and Startide Rising. I would prefer my stuff to remain in that company. Images: Patrick Jensen, Alexander Preuss and Frank Frazetta, B. Börkur Eiríksson and Francis Tsai.